Do you use social media? Want to engage your audience better? Updating your audience on social media can be a great asset when it comes to increasing your brand's popularity and reputation, however what many businesses don’t understand is writing any old social media post won’t help your cause. When it comes to writing social media posts it’s important to make them engaging, entertaining and interactive to enhance audience participation and interaction. 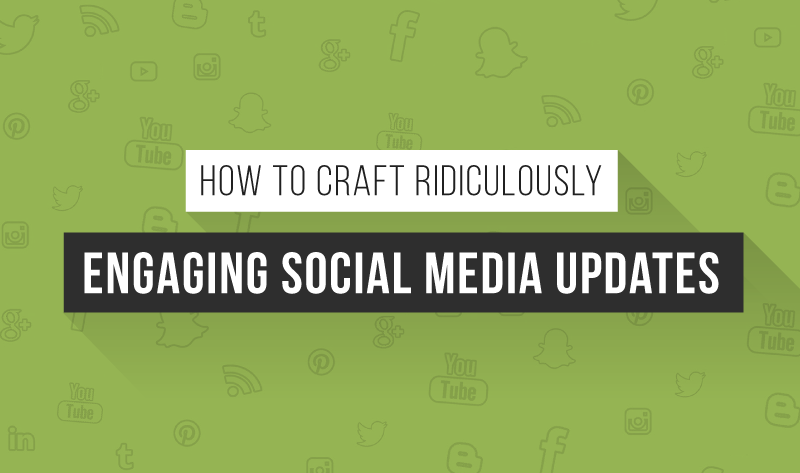 The following is a guide on how to craft ridiculously engaging social media updates that will help increase your followers, fan base, and potential customers. Have you ever read something that you’ve lost interest in because of its length? What many people don’t understand is that when writing for social media outlets you need to keep it short and to the point of what you’re trying to say. Your readers need to know exactly what you’re trying to say within the first few words along with giving them something to think about after they’ve read it. State what you’re trying to say as clear as possible. If you’ve ever read news articles you’ll see the most important information is always located in the first few sentences. They cover the top 5 W’s - ‘who, what, where, when and why’. This is the same for social media posts. When it comes to sharing a social media post you need to consider what information the writing is based upon along with how entertaining the information is to your readers. Do you have an image which hasn’t been seen before? Do you have new and exciting off the press facts or studies to share? It’s important to share something which offers substance to your readers. Your posts need to be intriguing enough for them to stay and finish reading. Some great ways of getting people to click through to your website is by placing a title that doesn’t offer an ending unless someone clicks through to the attached link. For example, your post may be about a new anti-aging product. You need to intrigue visitors enough to visit your website, so you may write a title which says ‘Secret Age Defying Product Revealed But…”. Intriguing right? It gets the imagination of your visitors working and wondering what the ‘but’ means. So this entices them to click through to see what the ending it. The ‘but’ may mean something simple like “Secret Age Defying Product Revealed But It’s In Limited Stock” but they don’t know that. The thrill of finding out how the title finishes helps to engage your audience better for a more interactive and lead generating post. Instagram: Hashtags are loved by users on Instagram. It’s advisable to use up to 11 hashtags per Instagram post. Blocks of texts aren’t as necessary on Instagram as other social media sites. Say you’re a business which sells calendars, you can write some hashtags that look like this: #calendarsforsale, #sceniccalendars, or #kittencalendars. Adding images to your posts also helps to enhance the meaning of the hashtags for better audience interaction. LinkedIn: LinkedIn is all about professionals. So when writing engaging posts it’s important to keep in mind who your target audience is. You could write about the news or best marketing strategy tips. It’s important to think about what you would see in an article that a CEO would like to read. Twitter: The key to engaging Twitter followers is by posting short and sweet posts. Posts which are under 115 characters in length work the best. Tweets tend to be very news friendly so work with engaging headlines. It’s also advisable to add a trending hashtag alongside the post as well for better exposure. Facebook: Facebook gives you more room to write than other social media sites. When writing updates for Facebook try to keep your post under 400 characters or 5 lines. Always speak in a friendly tone and use a casual voice. Image posts are much more popular than text or link posts so use images often in the mix. List formats, spacing and paragraphs are also a big winner for Facebook users. Everyone loves a great joke from time to time. In amongst your ordinary posts always place a humorous post in at least once or twice a week. It’s also advisable to keep the jokes on time (Joke Tuesday or Joke Friday). People love structure and timeliness. Once you have a trend such as this working for you, you’ll find that if you miss the joke for the week, your audience will tell you about it. This is a good thing because it means they're watching and listening. There’s nothing worse than seeing a social media post with mistakes all through it. Not only does it drop your credibility but it can also lose your followers. Make sure before each post is submitted that all grammar and spelling mistakes are accounted for. The use of perfect grammar will also help to convey your message clearly to your audience for better engagement overall. When it comes to writing ridiculously engaging content for your social media updates it’s all about targeting your audience with something that’s worth reading. Remember if you wouldn’t read it, they probably won’t either. Always use intriguing headlines, perfect grammar, and a little humor from time to time. For any business, writing engaging content can really enhance your lead generation and sales which can increase your profit margin. By taking the time to develop great social media updates you are well on the way to becoming a social media powerhouse for your followers and potential customers. By incorporating all these things, you can easily write a great post for all your social media accounts. Have you engaged your audience more? Tristan Gray is Managing Director at Studio 56 in Melbourne Australia. As a serial entrepreneur and business owner, he and his team now help business owners grow their business online through a large number of advertising channels. Tristan is great at thinking outside the box and helping his clients understand how to best get a return on their investment. He strongly believes in building good ethical networks with other like minded business owners.